We found an outside viewing platform, where you can watch planes taxiing in and out. This is just one of three massive arms of KLIA2. The volume of flights and passengers pouring through this building every day is massive! 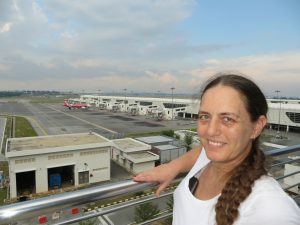 It was built, essentially, to cope with the runaway success of budget airline, Air Aisa, which hubs from Kuala Lumpur. Unfortunately, the platform was mainly occupied by smokers, so we couldn’t hang around too long. 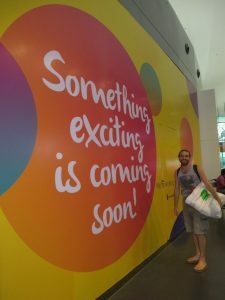 We found a massive food hall, restaurants, and convenience stores. There was a hotel we had never noticed before, hidden inside a shopping level. Some of the features were decidedly twee, while others were both cultural and beautiful. 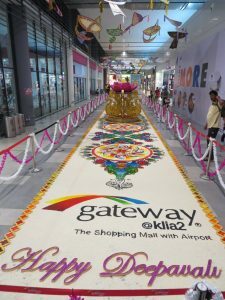 Malaysia was preparing for the Indian equivalent of the Western Christmas – Diwali (Deepavali). This is the one week that everyone is supposed to go home and visit their family. 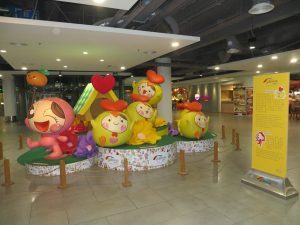 Decorations include lots of colourful banners and flowers, and the omnipresent dyed rice art. We have been invited to visit friends in India for Diwali, but have never done so. The one Diwali we spent in India we were staying in a Christian ashram and practising yoga every day! It was only a few hours between our flight landing and Erin and Tammie’s. They looked remarkably fresh for being just off an 8-hour flight! The girls were pretty keen to get to the hotel, so we skipped the usual stop-in for Milo Ais at the NZ Food Court. 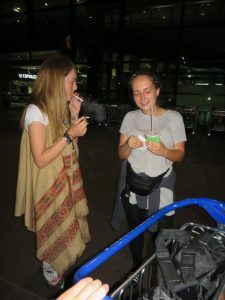 We booked ourselves on the next bus to Chinatown, and the girls had time for quick fag before it arrived. We paused on our way through the market to sample the tofu custard pudding with brown sugar syrup. Tammie confirmed that her gag reflex was working well. Mabel showed the girls her usual effusive welcome at Amigo Hotel, and we dropped the bags. Our first port of call was Vinnie Jaya for dinner, and a quick explore of the local area. There were lots of laughs, and Tammie was pleasantly surprised at how easy it is to be vegan in a place that has strong Indian cuisine roots. 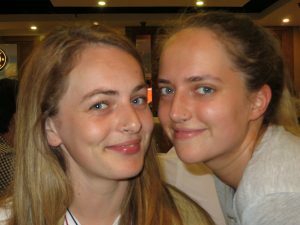 We had been saving a list of tourist activities to do in Kuala Lumpur when the girls were there. We didn’t have all that much time, since we needed to go to the embassy twice to get Thai visas, so we voted for an early night.